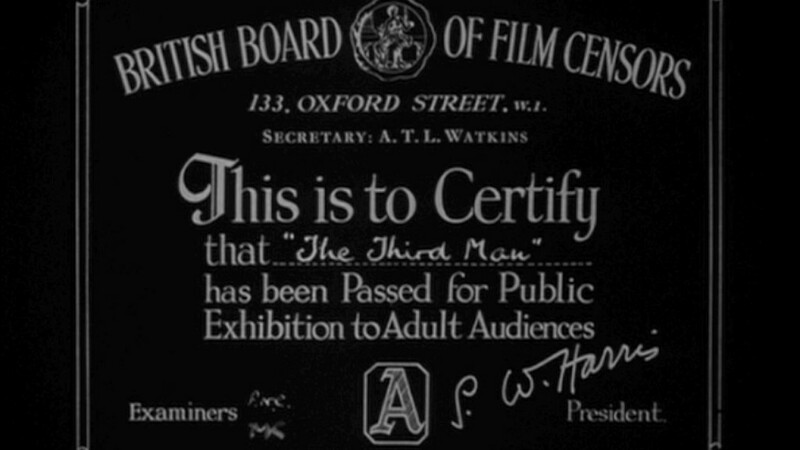 The “A” on The Third Man‘s official rating certificate is meant to stand for “Adult” and by 1949 no young people would be allowed into the theater, making The Third Man the British equivalent of an R rated movie. At the time there were only two ratings in the UK, Universal and Adult, but the British Board of Film Censorship (BBFC) would introduce Horror and EXplicit in the next few years. Filmmakers’ guidelines in the United States were stranglingly specific, causing a number of films to be banned outright. America’s stalwart Presbyterian moral defender, Will Hays instituted the MPPDA Production Code that held Hollywood’s head underwater from 1934 until it was finally disregarded with Antonioni’s Blowup (1966). The U.S. Supreme Court had ruled (in 1915’s Mutual Film Company v. Industrial Commission of Ohio) that free speech did not extend to moving pictures, so the club wielded by Will Hays’ commission was a deadly one; a censored film would be banned and destroyed. One might imagine that across the pond (not the pond adjacent to Hollywood) rules would be a little different, but the British film board’s guidelines were strikingly similar. Bad faith is the vilest, most self-destructive form of lying, since—according to Sartre—the liar thinks that what they say is true. This frame is a lie that thinks that it is the truth. But though Orson Welles didn’t direct this film, his grand influence is already felt here, starting the film with a lie. Just as *spoiler alert* “rosebud’s” truth is a lie—it never reveals Kane’s secrets to Thompson—this frame can do nothing to reveal the secrets of the film to the innocent viewer. Even its form is a lie, the beguiling white on black seeming to taunt us into thinking in a binary system of white and black, good and evil. But through the film this lie will be buried, the lie of the binary under shovelfuls of The Third Man.